Yep, that liangfen is popular among Guangdong and South East Asian Chinese. It’s eaten during summer as it’s touted that it can reduce one’s internal body heat. If you go to Malaysia (or perhaps Singapore? ), you can get shredded Guangdong liangfen served together with soy bean milk (豆浆). Quite yummy. John, those pics of liangfen are making my mouth water. Gotta go eat some. If Guangdong liangfen is anything like Guilin gao, I think it’s awful. Did you finish it? Jodi and I shared a bowl, and all we managed were a few bites. Like you said, weak flavor, but with a nasty, nasty aftertaste. Oh, and I think (and Jodi confirms) that 凉粉 was the nickname of Zhang Liangying’s fans, not the singer herself; like Li Yuchun’s fans were called 玉米, He Jie’s were called 河粉, and so on. It wasn’t too great, but I did finish my bowlful. I’m glad they didn’t push me to have seconds. I pretty much just swallowed the chunks whole. Does “凉粉” always mean bean jelly, i.e. the jelly of beans? I’m wondering if the Guangdong liang fen you had is grass jelly which is made from the gelatinised boiled juice of some monstrous herbal plant called 仙草 or of course, 涼粉草. Appetising. No, really. I think the pleasantness of its “cooling” effect is meant to override the unpleasantness of its slightly bitter taste. When I was in Hong Kong with my girlfriend in 2004, we ate at some dive where she ordered me a bowl of soup and noodles that also contained an assortment of items that looked like leftover parts of whatever animals they had slaughtered that week. One of these items looked almost exactly like your Guangdong liangfen, except it was brown in color. I asked my gf what it was, and she eventually told me that it was boiled pig’s blood. I’m sorry, man, I’m just not as open-minded as you. I just don’t do boiled pig’s blood. No way. Yeah, they sold that stuff in Oakland, they called it Black Grass Jelly. Great name but the taste didn’t live up. Sometimes it would be in the bottom of drinks, like with tapioca pearls. Something about that girl’s face looks Stepford wives or 50s housewife to me…not saying I would kick her out of bed, but it’s a bit freaky. congealed duck blood is actually quite good. in china, never ask how the food is made. I think “Guangdong Liangfen” is “black glass jelly” (“仙草蜜“-xian cao mi), which is made from some kind of plant. It tastes like pudding, but much bitter, so if you want good flavor you had better add some honey or juice on them. People often have them in summer and it is said to be a kind of healthy food. As to another kind of food “gui ling gao”, it looks exactly like the ” Guangdong liangfen”, but the materials are different, and it is made from some traditional Chinese medicine. 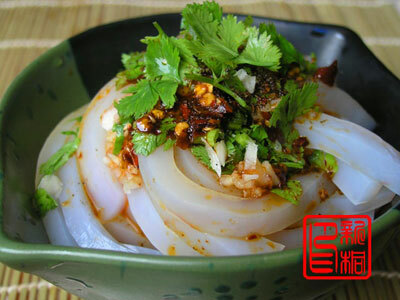 It is also a kind of healthy food popular in summer. Blood is completely non-transparent but all varieties of liangfen have a translucent character. Liangfen is not all made from bean. A number of plant or grain starch powders can be used to make a liangfen though the bean (绿豆) liangfen is by far the best and most consistent in elasticity and smoothness thus has been most popular commercially. I have had a kind from yam starch that is softer but, at the same time, more adsorbent which makes it yuuuummy. About liangfen being “a bit stiffer” than jelly. First of all, bean liangfen, like jelly, can be made into a range of firmness so it depends on the chef and varies from batch to batch. Secondly, liangfen becomes considerably brittle, or even falls apart, upon refrigeration. Therefore, never put liangfen, leftover or otherwise, in the fridge. 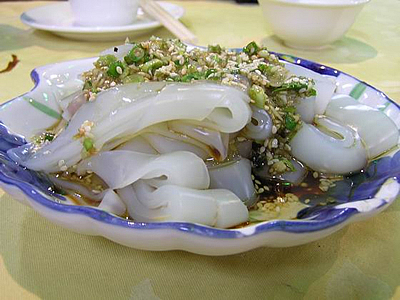 The same rule applies to cooked 粉丝、粉条 (bean vermicelli) or 米粉 (rice noodle). On the other hand, jelly is not afraid of refrigeration. And the biggest difference between jelly and liangfen is that jelly is almost completely transparent. These properties of jelly are due to its makeup, as jelly is made from Gelatin which, produced from animal (most often porcine) collagen, consists of water-soluble proteins. The stuff I didn’t eat in HK was definitely not translucent in any way. The picture above doesn’t look like it is either, but I suppose it might have a translucent quality that doesn’t come across in the photo. But the blood was cut into squarish pieces and had a jell-o quality to it. I would refrigerate Long Rice (mung bean, long kou) noodles all the time, it re-heats fine. Only weird thing is, when it’s cold it loses the translucency, but it comes back when you heat it again. Big Shanghai problem is you can’t find the proper thicker Long Rice noodles, just thin ones – maybe it’s a Canton thing. I have to believe they can be found somewhere though, anybody know? 凉粉 refers to the erstwhile Super Girl’s fans — one of the many lame puns on 粉丝 to spring up around the show. Which reminds me, somehow; does anybody know what kind of flour the noodles in Sichuan-style 酸辣粉 are made from? I’d been under the impression that they were made of potato starch or yam starch. I think the best use of 粉 is in 煎粉, starch cubes fried up and covered in a sour sesame sauce. Thanks for that correction; I added a note. I think all you other commenters are right in that it’s just “grass jelly” as opposed to a real type of liangfen. I’ve had the drinks with the grass jelly in them, though (I didn’t like those either), and it did seem a little different. But I think that’s probably just due to slight variations in the recipe. Not that I’m only paying attention to the Zhang Liangying section of this post… but, I noticed that the scrollover pinyin (a great feature) provides Zhang Jingying as the romanization for her name. I would not have known that character was pronounced “liang” if I hadn’t had a Chinese colleague leaning over my shoulder as I read it, and it kind of makes the whole liangfen reference obscure to the point of total opacity. A bit more like pigs blood than bean jelly, if you like. (see Gin and Stuart’s comments above). On the food subject I think I’ve tried your green cubes before as well, and remember them being alright. I’m pretty sure I had them in Hong Kong. Which, unless I dreamed this up in a particularly horrible nightmare, is also home to a dessert restaurant specializing only in sweets made durian. It was somewhere up in Sai Kung. They really do like their desserts down there. Although Liangfen and Guilingao almost look the same at first glance, Liangfen’s taste is way milder than Guilingao. I normally have Guilingao with sugar syrup or honey, just to balance out its bitterness. Where do you have the drink, uh… the “Michael Jackson”? We also have it in our country too, the only difference is instead of cutting into cubes, it’s shredded. So it can go through the straw when you are drinking the soy milk. Yeah, they are made from 仙草, at least in my country. I posted a comment last night, and instead of going to the comment section, i think it has gone to ether. Hmmm…..? Gee, now the whole “liangfen” thing makes a whole lote more sense. Thanks for the correction. I fixed it. Thanks for the comments. Good to see you’re still around! Sorry about that! Your comment (along with one other person’s) has been pulled out of the spam trap and has become the first comment. i’m not a big fan of 凉粉.I prefer the korean and japanese cold noodles instead. by the way, that last photo looks like 龟苓膏 which is a guangdong/hk dessert made of powderised turtle shell. they pour sweet syrup on top and it tastes better than it sounds. 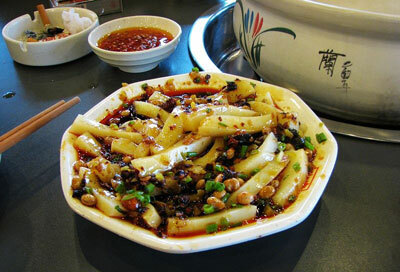 while the Liangfen itself at Kejia Area is called “仙人坂“，usually serve with honey to cover the bitterness or added with Banana-flavored extract (香蕉露). It is supposed to be a great summer drink/snack. I clecked on a link and read a bit of what i assume was a translated portion of the fatwa authored by the Professor. While the blog in question may have been mildly interesting in itself, the xenophobic reaction to the blog is much more interesting to me, because of what it indicates about the current state of Chinese culture. And besides the blog, and the Chinese reaction to it, it’s also very interesting the way certain westerners in China are reacting to the anti-foreigner reaction. Some seem to be saying that it serves the guy right if he (or perhaps anybody else who might be mistaken for a British male in his 30s) gets beaten up in the street for being in the company of a Chinese female. Besides the affrontery of someone having the audacity to actually put in writing the suggestion that a certain percentage of Chinese women are curious about, attracted to, or even prefer western men (um, excuse me, but WAS that really such a big secret? ), the professor makes it quite clear that he also expects honorable Chinese males to rise up in anger over the fact that the foreigner was expousing SPLITTISM. Was I the only one that reacted to the political attacks in the professor’s rant? Never seen a splittist in real life? A Splittist is anyone (inside or outside of China, Chinese or otherwise) who suggests that peaceful, democratic nations with free, open and vibrant civil societies (oh, say, Taiwan, for example) ought to be allowed to REMAIN free, open and independent, and not be continually threatened with attack by one-party states with un-elected leaders, no modern concept of civil rights or civil society, and its own inumerable and very serious domestic problems. Am I the only one that sees similarities between this campaign and last year’s anti-Japanese campaign and the mob scenes and riots that grew out of it? Every article I read about the anti-Japanese events mentioned, of course, that Chinese are stilll upset about Japan’s wartime incursions and occupation of parts of China, the Yaku-something shrine in Japan, and the sanitized version of History being taught to Japanese students. But what FAR too few of them mentioned are the true underlying reasons that certain parts of the Chinese establishment find it currently so expedient to encourage anti-Japanese sentiment. Japanese are understandably becoming increasingly concerned about China’s expansionist and militaristic ambitions. The true reason for the anger of Chinese officials was the fact that Japan signed agreements with the U.S. recognizing that the maintennance of peaceful cross-strait (China-Taiwan) relations is in the mutual interest of both Japan and the U.S? Is it not evident that THAT is the true reson behing the anti-Japan episodes? The official references to WWII, textbooks and the Yaku-something shrine are simply made to whip up popular anger. Those ARE important issues to History, but not to current affairs. Any ideas on why peace is so threatening to (some) Chinese? I have a few. Does all this make me a dangerous splittist element in China? Is it time to pack my bags? Am I showing my inablity to break out of western thinking and adapt to Chinese culture and traditions? Am I hopelessly orientalist, insensitive, unsophisticated? I came here to better understand China and Chinese culture, but I suppose patriotic Chinese will think I have learned too much already. dude, the last bowl of black jelly looks very much like the Chinese medicine called xx膏[i don’t remember the name]. It’s for the ladies…to make their skin smooth and long hair shinny and such…I hope I am wrong. John, in the states sometimes we are lazy so we open a can of 涼粉 and put maple syrup on it cause it’s readily available. There are also 涼粉 drinks and are popular in Guangdong and TW. they are basically the little bits of liang fen that are small enough to be sucked up through a straw immerse in a sweet dark liquid. It’s cool and refreshing in the summer, though it can be a bit sweet. Perhaps if you don’t like the regular straight up liang fen, I’d be more than happy to send you a couple cans of Liang fen drink. My girlfriend’s family is japanese, and they like to eat the 凉粉 too (the white one). In japanese it is called “coniaku” (something like this hehe).